At present the state aid supported Better Broadband for Norfolk (BBfN) project with Openreach (BT) is already working to ensure that 95% of Norfolk can access a fixed line “superfast broadband” (24Mbps+) network by March 2020 (here) or 91% in South Norfolk alone (at present the whole of Norfolk is on 92%+). Most of this is based on hybrid fibre FTTC technology. The Government and Ofcom have separately been working to establish a new “legally binding” Universal Service Obligation (USO) from 2020 (here), which will aim to cater for those who miss out on the BBfN project. Under this system consumers in such areas will be able to request a 10Mbps+ capable broadband speed (download) from a designated ISP (uploads of 1Mbps+). In response the South Norfolk Council last year established a new agreement with InTouch Systems (here) that aimed to support the deployment of a new 10Mbps+ capable wireless broadband network in digital disadvantaged parts of the region (i.e. fixed wireless broadband ISP ITSwisp). 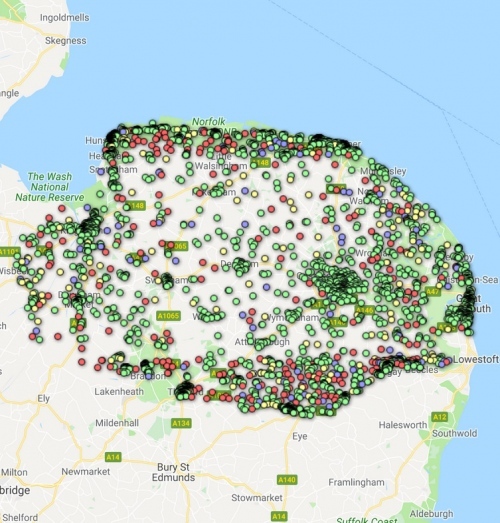 The work now appears to have completed and as a result there are a total of 33 wireless transmitters (20 on masts and buildings, 13 on churches, 24 located in South Norfolk and 9 just over the border). Apparently many of those already using the network are receiving speeds of up to 30Mbps, with 10Mbps being the minimum. “Once again we are leading the way in making sure that all of our residents and businesses have access to decent Broadband speeds. Working with InTouch Systems we are providing access to wireless Internet for homes and businesses who have not been able to benefit from the work done by Better Broadband for Norfolk. At this point we note that the council originally invested £570,000 into the Better Broadband for Norfolk (BBFN) programme. By comparison their agreement with InTouch Systems seems to involve a separate investment of £330,000 to deliver broadband into the areas not covered. We should point out that ITSwisp is NOT a designated USO provider and they have also not as yet expressed a serious interest to Ofcom in becoming one. In other words, this could perhaps be seen as a temporary solution until the real USO or something better arrives. On this front we note that the provider’s website primarily only promotes packages with download speeds of up to 8Mbps, while the 10Mbps package only appears to be available if you have a grant from the Broadband Delivery UK based Better Broadband Subsidy Scheme. But there’s a problem here because that voucher scheme is due to end this year. Another issue is that the ISP’s website only promotes the top package as offering speeds of “up to” 10Mbps, which is no longer allowed by the Advertising Standards Authority (i.e. they should be using ‘average speeds’ as measured at peak time). Nevertheless Michael Edney does clearly state that “many” users are receiving around 30Mbps on the network, which suggests that the 10Mbps figure is probably being conservative. However if you do take their 10Mbps package then the subsidy should cover any installation costs and locals will then only need to pay £31.99 per month on a 12 month contract. Granted it’s not the cheapest for such speeds but if you’ve struggled to get above 2Mbps before then it’s still quite a big improvement. If 30 Mbps is achievable wirelessly then why are they wasting money on paying BT Openreach (or whatever it’s called this week) on upgrading fixed lines to remote locations? Its achievable – though not everywhere (either at 30 or at all in some cases) – but its ultimately a bit of a dead end. Because while 30Mbps is an acceptable low end connection today (e.g. watching top quality video is only possible if the connection is otherwise unused) it’ll rapidly become too slow. It was only a decade ago that 8Mbps was considered an excellent connection, but these days we expect 50Mbps+ for heavier users. Putting in FTTP connections ensures it can keep up for another couple of decades, not just the next three years. Oh, and these places aren’t at all remote. Many of the notspots in South Norfolk are within 10-15 miles of Norwich, which is not just the biggest city in Norfolk but in the entirety of East Anglia. It’s not the distance that’s the issue, it’s the patchy rollout and the lack of commercial attractiveness for the small groups that have been missed out. Wireless coverage equals zero coverage in my eyes. I mean it’s better than nothing in the short term but long term it’s no solution. Upload speed is still none existent as well. Then there’s also latency and atmospherics to account for. Don’t forget a transmitter can only supply a certain maximum bandwidth, shared across all users so too many people using wireless from a single mast/transmitter and the service will slow and collapse until additional sectors/masts/backhaul is supplied.